More from the brilliant mind of Ruben Östlund! Vimeo has premiered his 2009 short film Incident by a Bank online in full for free, and it's definitely worth watching. The short film won the Golden Bear for Best Short Film at the Berlin Film Festival in 2009, and played at tons of other festivals, picking up even more awards along the way. Incident by a Bank is an amusing, meticulous recreation of failed bank robbery. It's presented in a single take where over 96 people perform intricate choreography for the camera. The film recreates an actual event that took place in Stockholm in June 2006. I'm a huge fan of Östlund, director of Force Majeure and this year's The Square, and it's exciting to go back and discover more of his older work. Thanks to Vimeo Staff Picks for premiering this. Original description: "Detailed and humorous account of a failed bank robbery: A single take where over 96 people perform a meticulous choreography for the camera. The film recreates an actual event that took place in Stockholm back in June 2006." 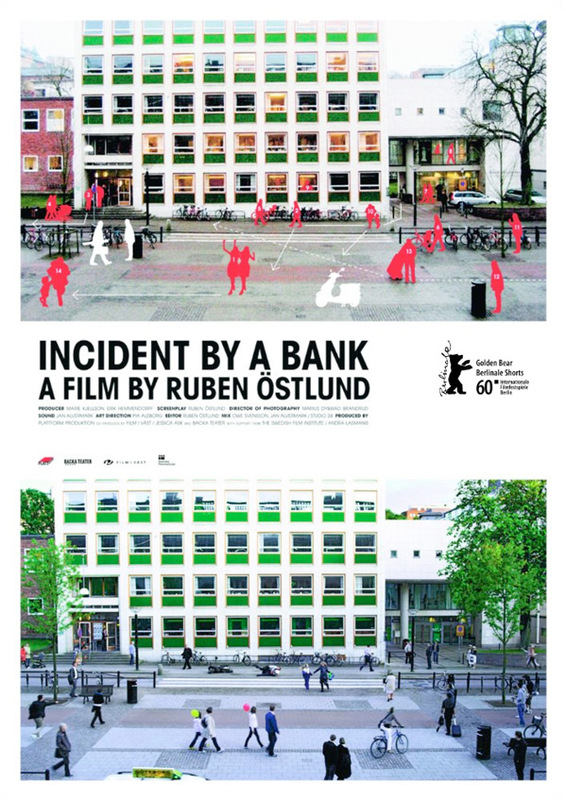 Incident by a Bank is written and directed by Swedish filmmaker Ruben Östlund, of the films Involuntary, Gitarrmongot, Play, Force Majeure, and this year's Palme d'Or winner The Square. This short film first premiered in 2008 at the Göteborg and Berlin Film Festivals, then went on to win awards and play at numerous other festivals, including Melbourne, Olso, BAMcinemaFest. For more, visit Vimeo. For more shorts click here. Thoughts?